Those who love fantasy and imaginary electronic music will certainly know the Austrian multi-instrumentalist Gandalf, aka Heinz Strobl. He calls himself a “painter of musical landscapes”, drawing inspiration from the numerous aspects of nature which he experienced during his extensive travels throughout Asia, Europe, North and South America. Just after Heinz Strobl had completed his debut-album “Journey to an Imaginary Land” he saw the cartoon-movie “The Lord of the Rings” by director Ralph Bakshi, based on the same state-of-the art work of writer J.R.R. Tolkien. This film gave him so much inspiration he decided to use the name of the wise magician Gandalf as his artist name from then on. Heinz Strobl was so fascinated by Tolkien´s thrilling fantasy-world he began reading all of his books, and it was in the same period he started work on his second album “Visions”. The idea for the album-concept was very much inspired by Tolkien. The epic story relates about the “Palantir”, the “seeing stones”, magic globes that could show scenes from near or far, future or past. So to his mind came the idea to compose a theme for the magician who’s looking into the magic globe, and each piece of music tells about one of the visions appearing in the globe, all connected by “The Magician’s Theme”. In this regard, Strobl states some inspiration may also have come from Modest Mussorgsky´s classic composition “Pictures at an Exhibitition”, as this also features the “promenade”-theme which connects the various pictures. 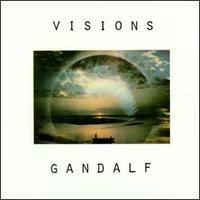 The songtitles on the Visions-album relate more or less to scenes from “Lord of the Rings”, but each listener may associate his own pictures with the music. For the recording, Heinz Strobl experimented with electronic sounds produced with a vocoder and with various synthesizers. Next to an the old Minimoog h used a Korg MS-20 with analogue-sequencer, a Crumar-Performer string-machine played through a flanger and a moog-filterpedal and the legendary Korg-Organ. For the acoustic sounds he used 6- and 12-string guitars, mandolin and sitar and a Les Paul for the distorted solo-sounds. As guest-musicians he invited Robert Julian Horky playing flutes and Jatinder Thakur from India playing tablas. All recordings were made on a Tascam 8-track (!) machine. Heinz recalls it seems the album has captured some real magic. As a matter of fact, it became one of his most successful releases and today can be considered as a “classic” in his career. After this album Gandalf released other fairytale like albums such as “To Another Horizon”, “More than just a Seagull” (released on his private Seagull-label), “Magic Theatre” and “Tale from a long forgotten country”. A fine selection of these years can be found on the sampler “Fantasia”. Many years later, in the year 2000, when Heinz was looking back on 20 years as a recording artist, he decided to record a special album to celebrate his 20th Anniversary. He wanted it to be a kind of a hommage to J.R.R Tolkien, who had inspired him so much in the beginning of his career, and so the idea came up to record the album “Visions 2001”. Keep in mind that at that time Heinz didn’t know that the New Zealand based director Peter Jackson was working on the monumental film-trilogy “Lord of the Rings”. 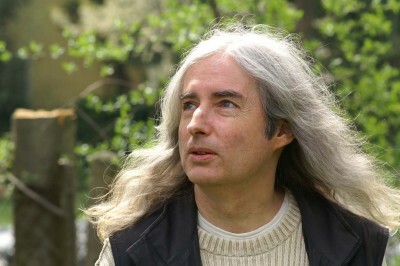 Heinz Strobl started to re-read the “Lord of the rings” books and began to select the scenes to be included in the music. He didn’t want to re-record any of the old material but create a new musical vision of Tolkien’s world from a point of view situated 20 years later. For the recording he invited some of his old and new musician-friends to contribute: Robert Julian Horky (flutes), Peter Aschenbrenner (flutes, soprano sax), Toni Burger (Violin), Wolfgang Wograndl (bass), his son Christian Strobl (drums & percussion) and Julia Martins. The latter added her vocals to the track “Just Go On Believing”. This time Gandalf recorded 70 minutes of brand new music on 24-track analogue-tape combined with ADATs. The beautiful music features Gandalf’s characteristic guitar playing in multi-dimensional sound-pictures, leading listeners into a kingdom of fantasy for a second time. 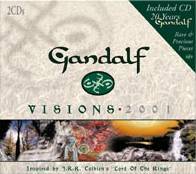 “Visions 2001” also contains a second cd which tries to give a representative view of the wide range of Gandalf’s music composed between 1980 and 2000. It features a selection of highlights of his former albums plus some rare and formerly unreleased live-recordings. For the record launch and celebration of the 20th anniversary, Gandalf and co played a show in an old established theatre in Vienna called “The Ronacher”. Altogether, 17 musicians were involved on stage, including very special guest Steve Hackett. With the latter, Gandalf had recorded the album “Gallery of Dreams” in 1991. Gandalf recalls the concert lasted for 3 1/2 hours and got a very enthusiastic response from the audience.